46 UCW NOVEMBER 1 - 7, 2017 WWW.UPANDCOMINGWEEKLY.COM WWW.FAYETTEVILLELADIESPOWERLUNCH.COM • #FLPL M A G A Z I N E Each luncheon a portion of our profits will be given to the Kidsville News Literacy and Education Foundation. 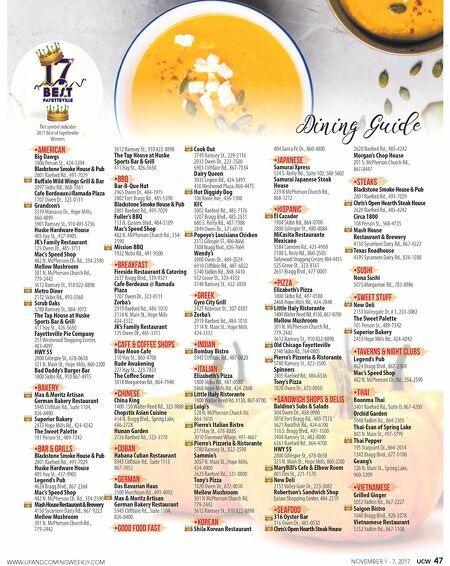 Join us November 9 for the Exclusive Shopportunity Expo with Wine Bar & Tasting! 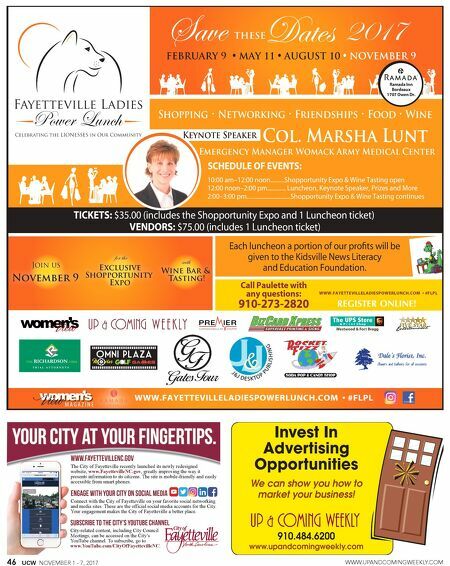 Save THESE Dates 2017 FEBRUARY 9 • MAY 11 • AUGUST 10 • NOVEMBER 9 Call Paulette with any questions: 910-273-2820 WWW.FAYETTEVILLELADIESPOWERLUNCH.COM • #FLPL SCHEDULE OF EVENTS: 10:00 am–12:00 noon..........Shopportunity Expo & Wine Tasting open 12:00 noon–2:00 pm............. Luncheon, Keynote Speaker, Prizes and More 2:00–3:00 pm...............................Shopportunity Expo & Wine Tasting continues Col. Marsha Lunt Emergency Manager Womack Army Medical Center Shopping • Networking • Friendships • Food • Wine Ramada Inn Bordeaux 1707 Owen Dr. Keynote Speaker TICKETS: $35.00 (includes the Shopportunity Expo and 1 Luncheon ticket) VENDORS: $75.00 (includes 1 Luncheon ticket) Invest In Advertising Opportunities We can show you how to market your business! 910.484.6200 www.upandcomingweekly.com YOUR CITY AT YOUR FINGERTIPS. www.fayettevilleNc.gov The City of Fayetteville recently launched its newly redesigned website, www.FayettevilleNC.gov, greatly improving the way it presents information to its citizens. The site is mobile-friendly and easily accessible from smart phones. ENGAGE WITH YOUR CITY ON SOCIAL MEDIA Connect with the City of Fayetteville on your favorite social networking Connect with the City of Fayetteville on your favorite social networking and media sites. These are the official social media accounts for the City. Your engagement makes the City of Fayetteville a better place. Subscribe to the City's YouTube Channel City-related content, including City Council Meetings, can be accessed on the City's YouTube channel. To subscribe, go to www.YouTube.com/CityOfFayettevilleNC.